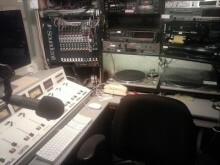 WMPG’s production studio is really impressive to people who collects vintage audio gear. They are amazed at the equipment that we use. They usually also ask when we will be moving into the next century. Now is the time! After 25 years it is now the time to ask for your support to help us upgrade and modernize our production studio. This upgrade will significantly improve our ability to offer access to broadcast quality equipment for your friends and neighbors to bring to you the community based programming you have supported for the last 43 years. WMPG’s mission is to provide Maine citizens with free local access to production and broadcast facilities to produce a high quality, community-oriented broadcast service to the people of Southern Maine. Our production studio is the main workroom of the station and sees heavy continuous use. Often live music is broadcast out of this studio. This music is archived and made available for future broadcast. With over one thousand of these recordings currently in our digitized library we have comprehensively documented the local music scene of the last 25 years. Efforts have already been underway to raise needed funds to begin the upgrade of the production studio. WMPG has already raised $8,500 towards this project, and we are confident in our capacity to raise the remaining amount within the next year from our listeners and local business community toward a total projected project budget of $65,000. Please consider making a donation right now online to a fund we are dedicating solely to this project. Your friends and neighbors here at WMPG thank you in advance and look forward to continuing to bring you the best community based radio in the world!